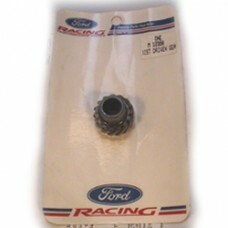 Ford Racing distributor gear. Steel gear for use with steel billet and late model production steel roller camshaft with EFI or Duraspark distributors. Also use with 302 MSD distributors with larger 0.531” shaft size. Outside diameter 1.249”. Inside diameter (shaft size) 0.531”. Application: Primarily late model production 302 EFI and 351W with steel roller cam, but also 289, 302, 351W if cam requires and larger diameter distributor shaft e.g. MSD.